SAN FRANCISCO – Today, as San Franciscans celebrate Lunar New Year, District Attorney George Gascón is kicking off a public education campaign to make sure the city’s diverse communities are aware of the Chinese Gold Scam, otherwise known as the Buried Treasure Scam. SFDA’s Special Prosecutions Unit (SPU) started looking into these types of cases in 2013 while investigating the Chinese Blessing Scam series of fraud cases. Like the Blessing Scam, the perpetrators of the Gold Scam have been organized teams of criminals from the People’s Republic of China (PRC) who are assisted by local facilitators; and like the Blessing Scam, because of the transient nature of the teams, SFDA has been working with law enforcement and prosecution personnel from across the country and across the globe in combating these types of affinity scams that prey on our immigrant communities. In addition to the San Francisco District Attorney’s Office, the key participants in this investigation network have been the Los Angeles Police Department (LAPD), the New York Police Department (NYPD), the U.S. Department of State (DoS), the Singapore Police Force (SPF), the New South Wales Police Force (NSWPF, Australia), the Vancouver Police Department (VPD) and the Royal Canadian Mounted Police (RCMP, Canada). The modus operandi of the Gold Scammers has been consistent throughout the world, and the “gold” props they employ to deceive their victims appear similar. The scam begins by either a telephone call or a visit to the victim by two to three suspects. The language used has been the Chinese dialect of Mandarin, also known as Putonghua. Evidence suggests that the victims are selectively targeted because of their perceived wealth since most of them have been successful business owners, professionals or public personalities who advertise or are known in the Chinese language media. During the introduction, the suspects portray themselves as poor migrant laborers from Mainland China in need of help from a friendly local who speaks their language and is generous enough to lend assistance. Having researched their intended victim, one of the suspects may even identify himself or herself with the same last name as the victim and suggests they have common ancestors to gain the victim’s trust. The scammers tell of a tale that they are in the host country to work in construction, and during excavation they found a buried container which held a large amount of solid gold ingots (yuen bo) and/or solid gold Buddha statues along with a handwritten note. Although the note is in Chinese, the scammers further appeal to their victim’s goodwill by stating they are illiterate and therefore need help from a trustworthy and prominent person to interpret the writing. Following the introduction, a meeting is held so the victim can inspect the gold and read the note. The victim is impressed by the amount and the weight of the gold pieces. The note, which is physically distressed to suggest it is very old, introduces its writer as someone who was living in the host country many decades ago (1800s to 1940s) and begs the finder to locate the writer’s son in Mainland China, give him one-half of the gold and keep one-half as a finder’s fee. The scammers will work to convince the victim it is impossible to find the writer’s son in China, then they offer to sell the gold to the victim for a fraction of its value. The scammers explain they are wary of bringing the gold back to China with them because they fear the port authorities will seize their treasure. Before they end the meeting, they chip a piece of gold off one of the ingots in front of the victim and hand it to him/her for independent appraisal. The victim believes the gold is genuine, and re-contacts the scammers. They agree on a cash price and often the scammers will add urgency to the situation by stating that because their visas will be expiring in a few days, they need the cash immediately. After the exchange is made, the victim finds out the ingots and Buddha statues are made of worthless yellow metal. Reported losses have ranged between thousands to hundreds of thousands of U.S. Dollars. On December 29, 2017, the RCMP reached out to our SPU to inquire about the identity of two suspects in two Gold Scam cases that occurred in Richmond, the neighboring city of Vancouver, Canada. One victim lost $26,000.00 while the other lost $48,000.00. 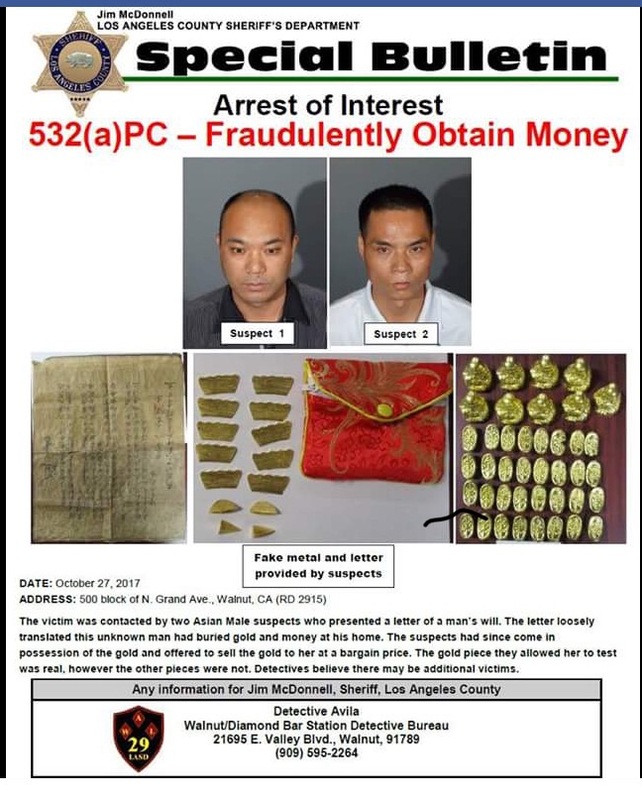 From investigative leads provided by SFDA’s SPU, one of the suspects was immediately identified as Dejin XU, a 52-year-old male PRC National who was arrested by the Denver Police Department and the Los Angeles Police Department for committing the Gold Scam in their respective jurisdictions in 2011. Further investigation linked XU to the second suspect, Zhong YANG, a 41-year-old male PRC National. On January 6, 2018, the RCMP arrested XU and YANG on two counts of fraud. The two men will be held until trial. On December 11, 2017, the Oakland Police Department notified our office that merchants in San Francisco Chinatown and Oakland Chinatown relayed that they were victims of attempted Gold Scams. The merchants recognized the scheme and the two suspects from news articles based on a Special Bulletin that was published by the Los Angeles Sheriff’s Department (LASD) in early November of 2017. The bulletin detailed the arrest of two male suspects in the 500 Block of N. Grand Avenue in Walnut, California on October 27, 2017. It contained photographs of the two suspects, a photograph of the “found” note and two photographs of the “found” treasure. According to LASD records, the two suspects were convicted of theft and released from jail on or about November 2, 2017. This type of transnational organized crime is yet another example of why SFDA works closely with the communities we serve. The San Francisco District Attorney’s Office encourages victims and witnesses of the Gold Scam to contact SFDA’s Special Prosecutions Unit. Anyone with information can leave a message at (415) 551-9595, press 3 for Cantonese and press 4 for Mandarin, and an investigator who speaks the corresponding dialect will follow up.